If you’re rough on your jewelry, you need a material that’s as tough as you are. Stainless steel can be found all around us in our appliances, surgical tools, architecture, and so much more. Life is short. 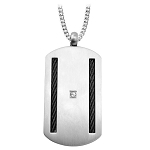 Make a bold statement with one of the toughest materials used to create fashionable jewelry today by browsing our collection of stainless steel pendants for men. Achieve that look you’ve always wanted with a classic dog tag or an elaborate pendant. We know you’ll turn heads, so be ready. Stainless steel is a relatively poor conductor of electricity, so our men’s stainless steel pendants are ideal for men working with electricity or in high-heat environments. Stainless steel is very easy to clean so it’s also ideal for the man who doesn’t want the commitment of caring for a high maintenance material. Excellence is in the details. 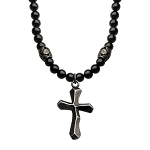 Browse our assortment of skull, fleur-de-lis, and tribal designs for yourself or for tremendous gift ideas. Ladies, if you’re trying to find the perfect gift to give to him on your anniversary, his birthday, or a special holiday like Valentine’s Day, you’ve come to the right place. 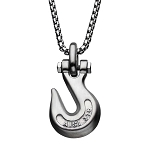 Our signature line of stainless steel pendants for men features a ton of fun design embellishments. 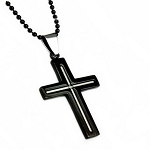 If your guy is a proud believer but isn’t the type to wear a rosary, surprise him with one of our cross pendants. 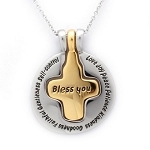 Our religious pendants come in a great variety of options including stainless steel color variations, spikes, car grilles, screws, cubic zirconia, detailed etchings, and a lot of other desirable accents. If you decide to add a personal touch to your gift by adding a specialized engraving, special order ring shipments may be insured and don’t require a lot of extra time. 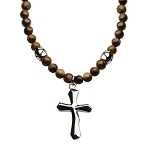 JustMensRings.com is your one-stop shop for amazing accessories and jewelry men love to wear. Take a look at our selection of men’s stainless steel pendants and let us know if there’s anything we can do help you with your decision.